As you may know, I walk on the beach a lot. I also run a little, but mostly I walk. Since walking on the beach is not exactly the kind of X-treme sport I like to be associated with, I have rechristened the activity “Night Striding”—an appellation I feel is more in line with my personality. As my sea glass collection began to grow so too did my interest in the hobby. I even started to develop preferences and favorite pieces among my finds. 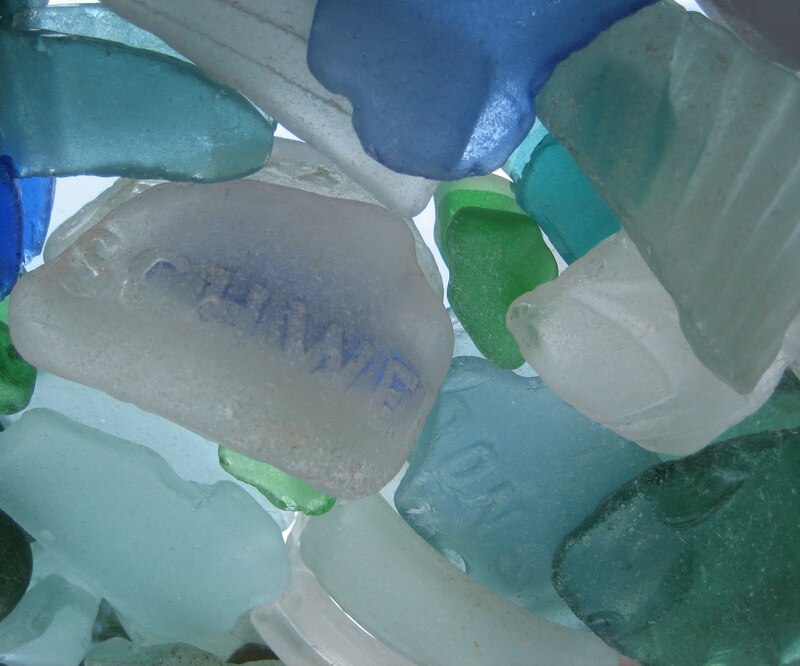 I turned to the web and found a community of fellow sea glass lovers, and I also discovered that most of my preferences were in line with theirs. I like ‘shards,’ as we call them in the community, with some evident history to them: manufacturer names, places of origin, etc. I also share my fellow collectors’ fondness for the edges of bottles: necks, bottoms, lips… things like that. I was not surprised, in my research, to read that the color of the glass you find is important, and that the scarcer colors are more highly prized. Black glass is very rare. So are red glass and orange glass. (I have yet to find any.) Brown and green glasses are the most common colors, and although shards in those hues are still treasured, they tend to be regarded as the “filler” of your collection and produce few standouts. Clear glass is usually called “white” glass in the community because the abrasions that accumulate on its surface while being ground up in the surf make it translucent, not clear. Although clear glass is probably the most common type of glass, pre-sea, it has a special value to collectors because it’s difficult to find. When “white” sea glass gets wet it becomes clear again, and this makes the shards harder to locate. For a long time blue glass ranked in the highest echelons of scarcity, but it has been somewhat cheapened in recent years because of the popularity of Sky Vodka and other en vogue blue-bottled concoctions. In fact, on the beach I walk, in Long Island, a trickle-down effect from the Jersey Shore crowd has ensured that blue glass makes up almost a third of my collection. Flesh tone? What? Why? Am I going to reject shards that don’t conform? So… not in a movie theater in Kansas? Not night. Not during snowstorms. 6. Optional: Some people move things around with a stick. · Glass collecting is believed to be a "senior citizen" activity. · For the same reasons, glass collecting could be embarrassing to do for a young person. · Take breaks. Don't hurt your back or neck. · Don't strain you eyes for too long, it may give you a headache. · Bring your mp3 player but use it at a moderate volume for safety. Seriously Manchurian President et al.? We’re talking about walking on the beaches, not storming the beaches or fighting on the beaches. I don’t imagine the injury rates among sea glass collectors exactly rival those of the NFL. Still, the apparent frailty of most of my fellow glass hunters got me thinking, is “sea glass collecting” really for me? I mean, “beach walking” didn’t fit my style, so I invented “Night Striding.” Might a similar re-branding be in order for my new pursuit? Yes. And so I have decided that I am now the world’s foremost “Shard Stalker.” While “Night Striding,” my senses piqued, my crouched, muscular form poised like that of a panther on the hunt, I track, locate and capture the polished, gem-like residue of crushed bottles. Stealthily, I then smuggle my ill-gotten gains to a private trove that I guard as jealously as a dragon protecting his hoard. I am the Night Strider, the Glass Hawk, the Shard Stalker… and may the gods have mercy on anyone who stands between me and my goals. 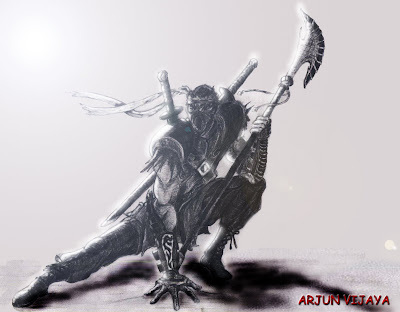 This is what I look like when I night stride for shards. Check out this, Chris: http://designyoutrust.com/2011/08/09/glass-beach/. Sorry about your elbow, mate. Hope that's healing up all right. Stick with the shard stalking, I say, and leave the skateboards to the youngsters.